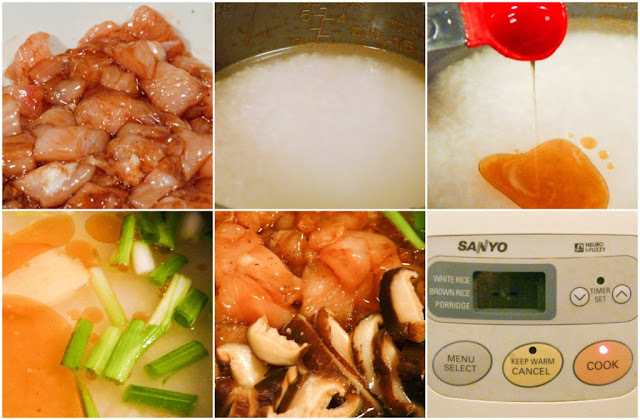 The Red Gingham: Rice cooker chicken rice to the rescue! So back-to-school fever hit our household today as we scrambled around shopping for last minute school supplies, uniforms and acceptable, "cool enough" clothing for my middle schooler. Throw 100 degree weather into the mix and you've got one very reluctant cook (yours truly) in the kitchen. I could have very easily picked up something quick for lunch but I was determined to stick to my pre-planned menu for the week which listed "chicken fried rice" as today's lunch. With some improvisation and a lot of help from my good ole' trusty rice cooker, I got out of slaving over a hot stove and was instead, able to focus on my to-do list. I've made this dish so many times in the past and it's one that my son particularly enjoys. He swooned when he found out that I would be making this for lunch instead of fried rice. (Yes, we're a household of enthusiastic foodies!) 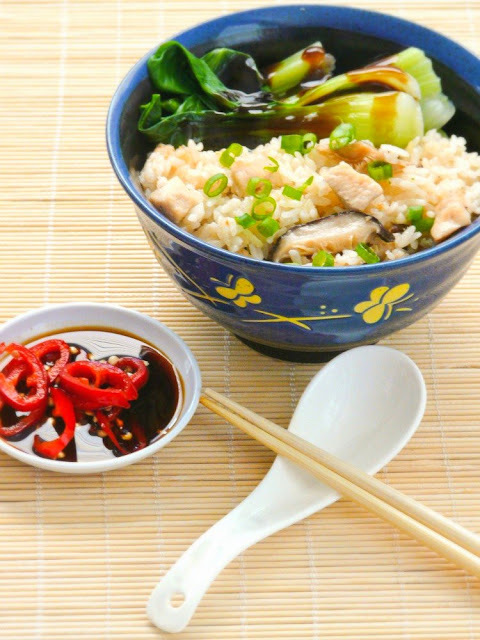 The wonderful aroma that wafts through the house is reason alone to cook this dish and the resulting flavor is reminiscent of Hainanese chicken rice. 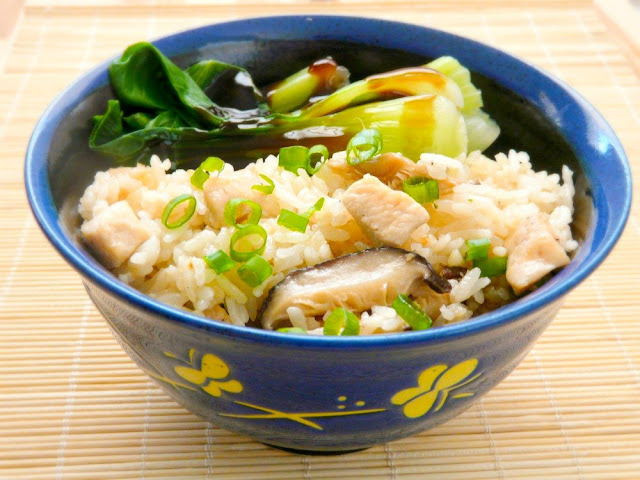 In fact, you can pretty much call it cheater chicken rice because it is that easy! Adapted loosely from Allrecipes.com, makes 3 to 4 servings. Finely slice or dice the chicken meat then marinate it in the oyster sauce and a dash of pepper. Set aside for 15 to 20 minutes. Wash the rice well. Drain the rice and add it to the rice cooker pot. Pour the chicken stock or broth into the pot until it reaches the water fill line for 3 cups of rice. Next, add the sesame oil, garlic, green onions, ginger to the pot and give it a stir to mix everything up. 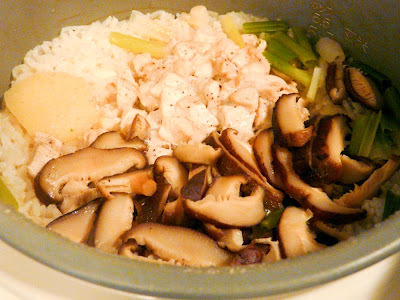 Finally, add the chicken and mushrooms then turn the rice cooker on. Make sure it's on the 'white rice' setting if you have a neuro fuzzy rice cooker. Now get out of the kitchen and enjoy your little break from cooking! Your kitchen and house will soon smell divine. When the rice cooker is done cooking and switches to the Keep Warm setting, open it up and mix up the rice with a rice paddle. Serve immediately and top with more green onions if desired. Freshly cooked chicken rice ready to be served up. 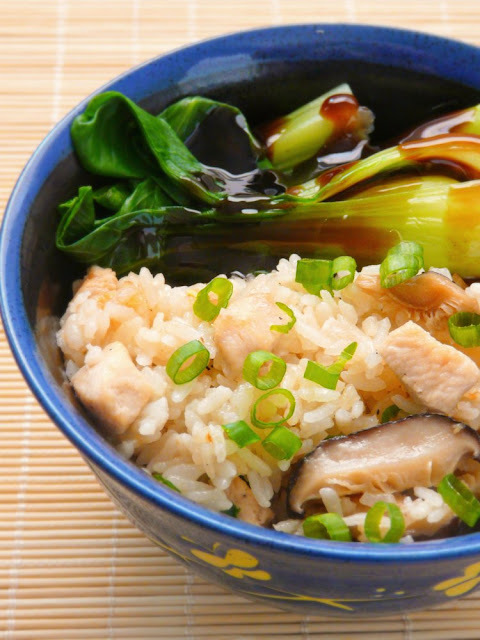 I served my chicken rice with some steamed bok choy drizzled with a little oyster sauce. LOVE this "Cheater" chicken rice. So easy to make and I am convinced by your photo that it taste good as well. It was yummy! Will be trying other rice cooker recipes soon. Thank you as always for stopping by!